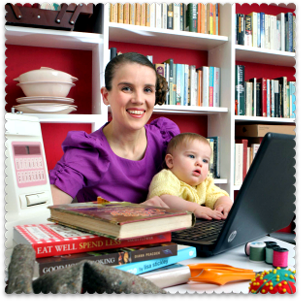 One of my newest followers on Twitter, Jenn Davis of CheapTweet, found the Miss Thrifty blog via my Favourite Frugal Twitterers post and dropped me an e-mail with some info about the new CheapTweet site. 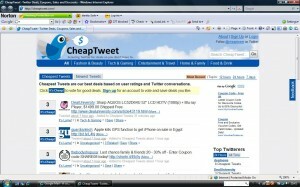 CheapTweet – http://cheaptweet.com – is a website that mines Twitter for posts about deals, coupon codes and sales. Tweets about deals are ranked based on user votes and how many times a deal is mentioned on Twitter. With the holiday shopping season upon us, everyone is looking for the best shopping deals they can find—and online merchants are trying to get hip by posting exclusive deals and discounts to Twitter followers. Still, consumers don’t want to clutter their Twitter feeds with several tweets a day from each merchant, so CheapTweet was created to cut out the mess and aggregate just the best deals for shoppers. It’s easy to peruse deals by category or do specific searches. Just like Twitter democratizes communication, we’re democratizing deals. We’ve got Dell coupon codes, special offers from Whole Foods and free shipping from the smallest Etsy shops selling handmade crafts. 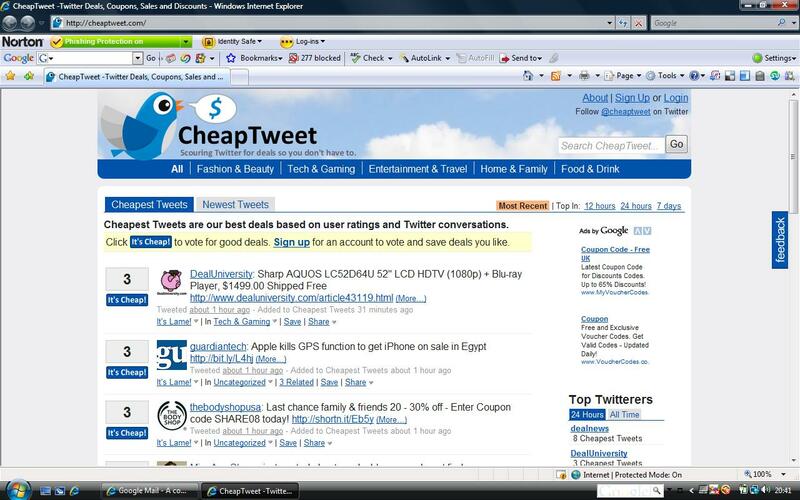 I’ve checked out CheapTweet and it looks interesting; I’ve popped a screenshot up above. As you know, I’m a fan of Twitter right now – but you don’t have to be a Twitter user to access or use this site. It’s open to everyone. So CheapTweet scans Twitter and compiles lists of the deals featured there; as you can imagine, there are plenty of them – and UK readers should note that most appear to be American in origin. No free shipping from Macy’s for you, Britishers! 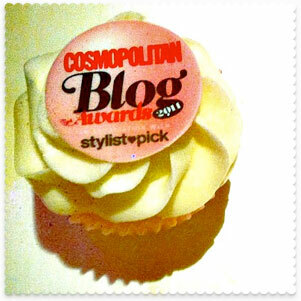 The various deals are divided into sub-sections: Fashion & Beauty, Tech & Gaming, and so on. Deals both large and small are featured, so you will find people’s Etsy bargains alongside SouthWest Air deals and Toys R’ Us coupons. Users who register with the site can vote deals up and down, Digg-style, so the most popular ones appear at the top. I’d love it if the deals could be categorised by country as well as retail genre, but CheapTweet is a neat project.